For 393 + 398 patients from Mainz + Ulm an exact dosimetry for 7 heart structures has been carried out. Technical treatment data from radiation oncology have been determined for 1019 patients with radiation therapy in Mainz. The clinical files have been merged with these data, then supplemented and corrected. The exact dosimetric sample has been analyzed in detail according to the current SOP for various heart structures and dose metrics. The accuracy of the retrospective dose analysis was examined. Prediction models for the heart structures have been developed for three dose metrics (mean dose, dose in the two cubic centimeters with greatest exposure, percentage of the volume with more than 10 Gy) and the prediction error has been quantified (Wollschläger et al. 2016, 2017). The reliability of contouring the heart and its devised sub-structures has been validated in a multi-centre-study with the objective to evaluate the geometrical as well as dosimetrical inter-rater agreement. Recruitment of the cohort:Inclusion criteria to be admitted to the PASSOS heart study were loco-regional primary tumors (ICD C50, D05) which have been diagnosed between Jan 1st 1998 and Dec 31st 2008. Clinical relevant data regarding the details of the diagnosis have been captured for all patients (TNM status, receptor status, age at diagnosis etc. ), as well as details with regards to therapy and (cardiovascular) comorbidities, prevalent already at the time of first diagnosis. In total 1250 former patients of the University Medical Center Mainz have met the inclusion criteria for the PASSOS heart study. Including the already existing data of the BRENDA study from Ulm (plus network clinics) the PASSOS heart study comprised 11,982 breast cancer patients. Mortality follow up:The maximum observation period was 14 years, since the target date for the mortality follow up was set to Dec. 31st 2012. Determination of the vital status of the patients at this date was done via the registration offices. The responsible medical authorities have been contacted in order to determine the cause of death for deceased patients. The confidential part of the death certificate, which shows the cause of death, has been requested for each deceased person (n=2.467) and the causal chain has been encoded according to ICD-10 (10th revision of the International Classification of Diseases) from the anonymized death certificates. Registration of morbidity:Information regarding radiation induced cardiac diseases (coronary heart disease, heart valve defects, and disorders in the conduction system) has been collected in a survey. The questionnaires concerning cardiovascular diseases have been sent out in 2014. The contacted patients have additionally been asked for permission to validate the information given in the questionnaire (self-disclosure to cardiovascular diseases with date of diagnosis) at the attending local physician. Out of 9.338 contacted patients, a total of 5.502 women have sent back the questionnaire to the respective study center. The site-specific response rates were 74.5% (Ulm), 70.5% (Mainz) and 51.0% (network clinics). Question 1: How does modern radiotherapy influence the cardiac mortality risk for patients with breast cancer? The simultaneous influence of several variables on the cardiac morality risk has been examined with multi-variate cox-regression (Fig 1). Laterality does not have a statistically significant effect on the cardiac mortality risk, with a hazard ratio (HR) of 0.94 (95% confidence interval [CI] 0.64–1.38) for left-sided versus right-sided radiotherapy. In this model, the following variables have been taken into consideration as confounder: age at diagnosis, chemotherapy and cardiac history. As expected, age turns out to be a significant risk factor for cardiac morbidity, just as heart diseases already prevalent at the time of the breast cancer diagnosis. In this analysis, the cardio-toxic effects of chemotherapy do not show statistically relevant effects regarding the endpoint of the cardiac. A sensitivity analysis showed similar results for women not treated with RT (Merzenich et al. 2017). Question 2: How does modern radiation therapy influence the cardiac morbidity risk of patients with breast cancer? The (self-reported) occurrence of heart attack, angina pectoris, coronary heart diseases, arrhythmia or a heart valve defect after breast cancer therapy has been defined as cardiac incident. Overall 458 incidental cardiac events (out of 4.474 responders) have been considered. The influence of laterality on the cardiac disease risk has been examined in a multivariate cox-regression serving as a proxy for the exposure to ionizing radiation (Fig. 2). 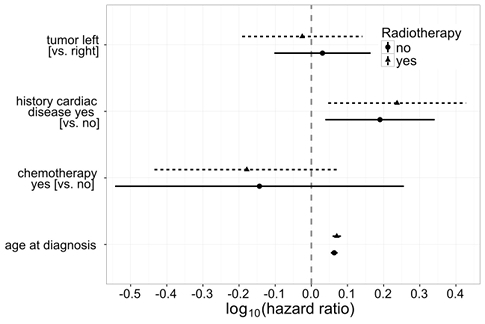 When comparing left-sided to right-sided radiotherapy, a hazard ratio of 1.07 (95% CI 0.89 – 1.29) was observed, and thus no statistically significant risk increase for cardiac incidents. The model considers the influence of age at diagnosis of breast cancer simultaneously to cardiovascular risk factors (thyroid diseases, hypertension, hyperlipoproteinemia, diabetes, CoPD, BMI, chronic kidney disease). Furthermore, cardio-toxic effects of chemotherapy as well as endocrinal therapy are adjusted for (Wollschläger et al. 2017). Retrospective radiotherapy plans have been generated at the universities Leipzig and Rostock with diverse radiotherapy techniques for approximate 150 patients (3D-CRT, IMRT, brachytherapy, hybrid techniques) and clinical, geometrical as well as dosimetrical parameters have been collected. When looking at the dose-volume relation it became apparent that the distribution of high and low dose volumes within nearby risk organs can vary greatly between different radiotherapy techniques. In addition, the mean dose of nearby and distant risk organs is increased by 5-20% in almost all cases when using the IMRT technique. For example, an explicit protection of the heart when using the IMRT technique does indeed lead to a moderate reduction of the high dose volume in the myocardium but can simultaneously increase the lung dose by a multiple of the reduction in the heart. The dose to the contralateral mamma increases approximately by a factor 2-3 when using the IMRT technique. The data have been transferred to WP4 in order to derive a personalized quantification of the probability of second primary carcinomas from application of the various techniques. Besides individual biokinetics, patient-specific voxel models (and corresponding SAF values) have been taken into account for a personalized dose calculation. In order to receive patient-specific SAF values, an individual adjustment of the existing physiological models was carried out with the help of so called polygon-mesh-models. For this purpose the male polygon-based reference model has been scaled in a way so that it resembles an existing big and a small voxel model regarding dimensions that can be easily measured from outside. Using these models, the specific absorbed fractions (SAF) were calculated for internal photon and electron sources. By combining the different SAFs with individual biokinetic models of an 18F based radiopharmaceutical, the influence of uncertainty in the body build and of the determined cumulative activities on the patient dose was examined. A scientific article has been submitted. On that basis it has been examined by means of uncertainty and sensitivity analyses which parameters have to be precisely known for the determination of an individual dose in nuclear medicine. It has turned out that it is most important to determine the organ activities. The dose is only influenced in second order by the specific absorbed fractions (SAF). Therefore, detailed patient-specific models are not necessary in this regards but approximate models are sufficient. An according draft for publication has been composed and will be submitted soon. Cardiovascular diseases. After a systematic literature research, 344 full text articles out of 1132 abstracts have checked for exposures above 4 Gy, for available reconstruction of heart dose in the examined patients and for reported dose-related relative risks of myocardial infarction, ischemic heart disease or cardiac death. 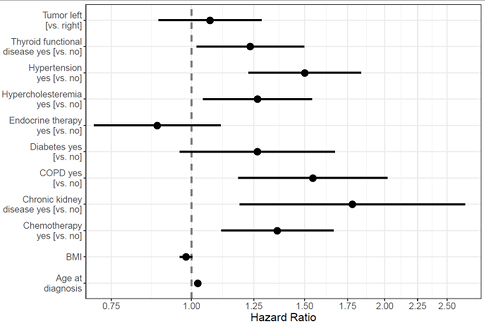 The reported relative risks from 12 articles have been extracted and merged in a joint model. Second primary malignancies. Out of 141 full text articles, 42 articles have been selected, referring to patient groups with exposures above 4 Gy due to radiotherapy, with reconstructed absorbed organ doses, and reported relative risks for dose categories or steady excess relative risks per gray. The reported risks have been extracted from all articles and transferred into a database that can be dynamically visualized. The data have been transferred to an integrated model, separated per exposure during childhood versus adulthood, as well as per group of second primary malignancies. Models for long-term risks after exposure to ionizing radiation with low and medium organ doses, as occurring at radiological examinations or at radiation therapy for organs remote from the treated tumor, have primarily been developed from data of the atomic bomb survivors of Hiroshima and Nagasaki. An advantage of this data set is the size and quality of follow-up, and that the risk dependencies of age and gender can be considered. The different morbidity rates between the Japanese and the German population have been corrected for. Organs which haven’t been exposed to high doses and in which radiation induced cancer develops relatively rarely were grouped together in order to increase the statistical power in the cohort. Different models have been combined using the method of multi-model inference, if they fitted the data similarly well. The dose distributions in ipsilateral lung, heart, contralateral breast and bone marrow have extremely strong dose gradients: The dose distribution can range from mGy up to several 10 Gy within the organ. There is no epidemiological study that can cover this dose range with appropriate statistical power. Thus an interpolation is carried out in the current project between low-dose models and high-dose risk coefficients. The interpolation is based on the dose ranges underlying the respective studies as well as on the appropriateness of the exposure scenarios examined in the studies, as compared to medical exposures relevant for PASSOS. Data sets of about 150 patients with breast cancer were provided from the clinical partners (WP2) for up to 5 different radiotherapy techniques, with detailed distribution of the organ doses. These data have been analyzed together with WP2. Prediction models of the dose distributions within lung, heart and contralateral breast in dependence on anatomical parameters have been developed for all radiotherapy techniques. This means that the organ doses can be estimated already before the therapy planning. “Risk assessment tool (Radiation therapy of breast cancer)”: computation of personalized estimates of cumulative/lifetime radiation-attributed and baseline risks of second primary cancer or death from heart disease for alternative implementations of radiation therapy (RT) following surgical treatment of breast cancer. Risks computations are performed for various endpoints, defined as a list of malignant diseases, according to ICD10 classification, or a premature death from a cardiovascular event or disease. Cancer endpoints can be defined as aggregated for all, all solid, hematopoietic malignancies or separately for any given malignant disease. Currently, the most advanced is the first operation mode of the tool, which represents the most complex and challenging task. Here, the risks are evaluated taking into account individual properties of a breast cancer patient: age at diagnosis, diagnosed stage of the disease, tumor localization (side). Smoking behavior, tumor localization (quadrant) and other RT plan-specific anatomical parameters are seen as obvious extensions of the implemented technique. Risk estimates for organs proximal to PTV are challenged by highly non-uniform dose distributions, spanning from very low doses to several tens of Gy, so the risk integration within volumes of these organs is performed using both low-dose (LD) and high-dose (HD) risk models described above in AP4 section. Disease-specific dose ranges have been selected for smooth transition from the LD- to HD-models. The Multi-Model Inference (MMI) technique is used to aggregate several risk models accounting for their statistical quality, thus catching uncertainty inherent to epidemiological data. For the given endpoint, the tool outputs cumulative values of the total baseline risk at pre-defined time grid and cumulative attributable risks for the user-selected alternative breast cancer RT modes. Uncertainties of the risk estimates are currently indicated by 95% confidence intervals; however, due to the fact that the tool generates a statistical sample of the risk estimates any confidence interval or the distribution percentiles can be reported. Due to unforeseen complications and delays in other work packages, at the time, development of the tool is not fully completed and still continues. A working version with restricted functionality is anticipated in the near future.